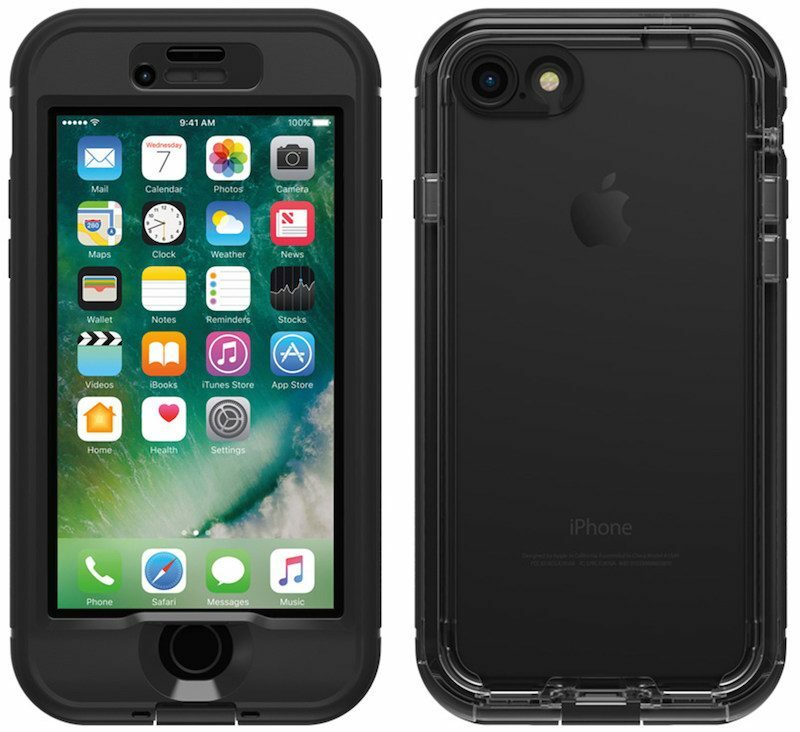 Well-known case maker LifeProof today unveiled a new version of its waterproof NUUD iPhone case for the iPhone 7 and iPhone 7 Plus. The company put an emphasis on making a slimmer case while ensuring that it remained waterproof and drop proof (up to 6.6 feet), as well as dirt and snow proof. Like previous NUUD cases, the iPhone 7's screen is uncovered, providing direct display access "while adding minimal size and weight to the phone." The company also noted that all features of the iPhone 7 and iPhone 7 Plus remain accessible with the NUUD case on, "making LifeProof iPhone 7 and iPhone 7 Plus cases a by-your-side necessity for any adventure." "Our engineers consider a lot of consumer feedback in the design process, and they set out to create the best NÜÜD ever," said LifeProof CEO Jim Parke. "They've done just that. The new NÜÜD design for iPhone 7 and iPhone 7 Plus features a fully transparent back so you can show off your iPhone and enhanced audio to keep calls and music crystal clear. NÜÜD delivers an experience that's in a league of its own." Other additions to the new case include a transparent back "so you can show off your iPhone," as well as enhanced audio so phone calls and music remain crystal clear while the NUUD case is on the iPhone. The camera cover has also been redesigned to collect less dust so users won't have to worry about debris getting caught and disrupting the lens field. NUUD for iPhone 7 and iPhone 7 Plus is available to purchase for $99.99 on LifeProof's website. Colors for both versions of the case include: Black, Mermaid Teal, Midnight Indigo Blue, and Plum Reef Purple. Omg, look at the bezel on that thing. I've tried so many brands of these waterproof cases, and while they do the job of protecting the phone, they all exhibit the same horrible side-effect - the audio becomes so muffled or distorted to the point where it becomes unbearable. Let's hope that the next iPhone will offer the same technology in the Series 2 Apple Watch so a case won't be needed, at least around the speakers. Lifeproof makes nice cases. The main problem is they take too long to come out. If I get a new iPhone on launch day, which I have since the original. I either have to keep it naked until Lifeproof makes theirs. Which usually takes months or buy someone else's case to use until then. So on top of Lifeproofs high price, I have to pay for different case for those few months waiting for lifeproof. Thanks but, Lifeproof, you've lost me as a customer. They are always late to the party with cases for new iterations of phone and they lie with the reviews. What do I mean by that? Before the case was available, they had published on their web site 4-5 star reviews of how great the cases were. Otter-box - thanks a lot for destroying what used to be a great brand. Well as much as I complained about Apple taking the headphone jack away, I have to admit in one respect they've made my life easier by making me have to worry about getting debris and dirt into one less port. So I don't really need a case that's quite this protective. And certainly not for that price, yikes. I do have a $18 Supcase that looks and functions much like an Otterbox to keep dirt out of the one remaining port and it can attach to a belt clip and it can take a bit more abuse than any of my other cases. I would only use it when working on my landscaping projects though. For general use it is bulky and obtrusive and messes with audio like you all say. My favorite case so far is an Urban Armour Gear folio case. It's soft and easy to put on and take off, but protective and has a card slot for my drivers license. I can also squeeze a $20 bill or a credit card in there if I need to. The folio flap protects the screen nicely. That's the one I'll take out in the snow. I don't notice it messing with the sound. At the beach I'm still going to use the zip-to-lock baggy style case I've always used for smartphones. They look geeky but work great for me and they're cheap. And they give me the option of hanging the phone from a neck strap. At the beach I'd be using my SE anyway because I don't want to lug my monster iPhone 7 plus around when I am building sand castles with the family. When I want to go slim I use an Apple silicone case or no case at all inside of the house. I have a LifeProof case for my 6s because it's not a waterproof phone. You don't need to spend so much on a "waterproof" case for the iPhone 7 as its water resistant already. If you intend on buying this case for protection, there are much cheaper (and frankly less ugly) options out there.